Bradley Darryl "BD" Wong (born October 24, 1960) is an American actor. Wong won a Tony Award for his role as Song Liling in M. Butterfly. 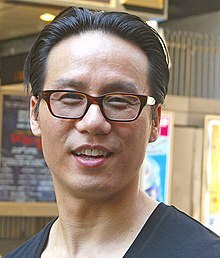 Wong is known for his role as Dr. George Huang on Law & Order: Special Victims Unit, Dr. Henry Wu in the Jurassic Park franchise, his role in Mr. Robot, and as Li Shang from the Disney animated movie Mulan. Wong appeared in the TV series Gotham as Hugo Strange. ↑ Christopher Stone (November 16, 2005). "B.D. Wong: Out Author, Actor and Parent". AfterElton. Archived from the original on April 19, 2008. Retrieved May 19, 2008. This page was last changed on 31 March 2019, at 02:42.